Would somebody send me a crappy mini comic? I’m getting tired of all these great minis. Well, not really, but variety is the life of spice and all that. From the title I was thinking that this was going to be a comic about aging, but no, it’s all about Kelly losing her job and trying to find another one. There’s her initial reaction to losing it (laughing out loud, as the man firing her was apparently a moron), sitting around at work during the transition period with nothing to do, and her entirely too honestÂ spiel at a family reunion. Then the unemployment really kicks in and Kelly starts finding it hard to bother getting up in the morning. 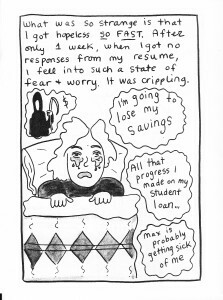 There’s also the reactions of friends and family, Kelly’s ongoing freakout about the lack of employment (that even she was surprised by), and the utter lack of a response from all her applications. 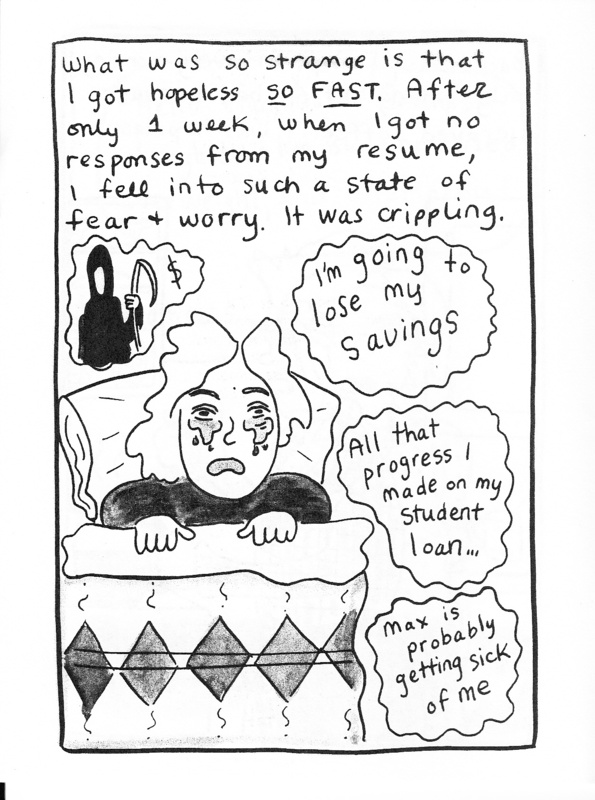 More than anything this comic demonstrated how pretty much all of us are hanging on by a thread that could be taken away on a whim from somebody that we’ll never meet. Creepy, huh? Things do take a hopeful turn towards the end, more or less, but then she includes a block of text on the back cover talking about how unemployed people aren’t even counted in the statistics after they stop looking for work (like me!) and how long it’s going to take, even under ideal conditions, to get it all back to “normal.” It takes skills to make this funny and insightful instead of just depressing, but she managed it. No price that I can find, but I’m going with $2. 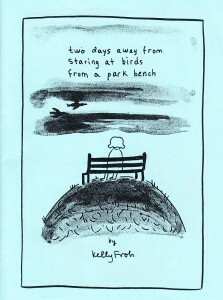 Posted on July 19, 2011, in Reviews and tagged Kelly Froh, Two Days Away From Staring at Birds From a Park Bench. Bookmark the permalink. Comments Off on Froh, Kelly – Two Days Away From Staring at Birds From a Park Bench.